On this website we'll be collecting some of our favorite moments from journalist Taylor Lorenz. Taylor Lorenz is not associated with this website in any way, but we hope she notices all of the hard work we put into this parody website. Our girl Taylor is a fierce warrior who's willing to go the extra mile and do things that no other journalist is willing to do. Her most noteworthy accomplishment was revealing the names of Pamela Geller's children to the entire world in a Daily Beast Article . What makes this so amazing is that Pamela Geller received death threats from the terrorist group ISIS . Not everyone is willing to expose someone else's children to terrorists, but Taylor Lorenz is. SO BRAVE. 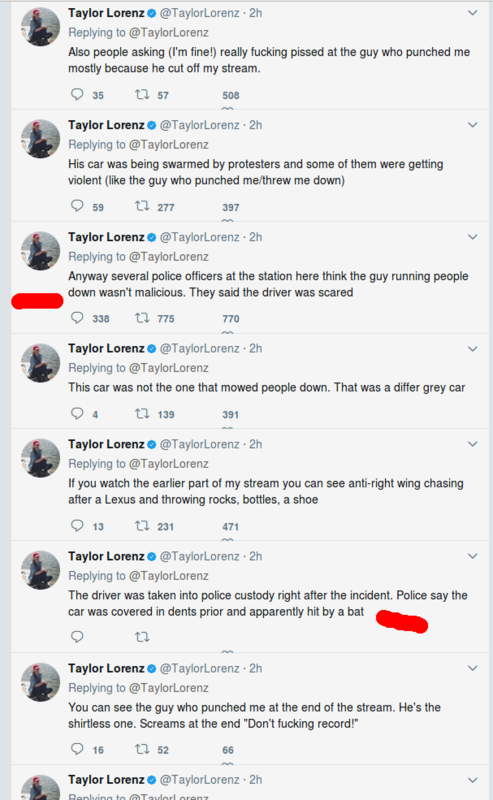 Our next favorite moment from Taylor Lorenz career is when she deleted tweets from her on-the-scene reporting when they didn't agree with the narrative that they wanted to push for the Charlottesville Rally. Taylor was an on-the-scene witness to car accident that resulted in the death of Heather Hyder. Her original tweets said, "the driver's car was being swarmed with violent protesters". She then commented that several officers told her they "didn't think the driver running people down was malicious" and that the driver "was scared". She also mentions how protesters attacking a Lexus with rocks and bottles, and how the car involved in the accident was covered with dents from a bat. However, Taylor Lorenz will delete her tweets that disagree with the MSM narrative, that's because Taylor is a team player, you go girl! SO BRAVE. If there is one thing that we can all admire, it's a journalist who changes their story when an important political agenda is at stake.